Well sometimes things at the farm just don’t work as we planned, and so we pull up our cowboy and cowgirl boots and figure it out. Such was the case with our dear little Yeller Feller. When Yeller Feller showed up at the farm, he was skittish, and Cowboy and I worked hard to get him to trust us and let us give him good scratches behind the ears. Well once that little guy got a taste of affection, he decided we humans could be pretty nice. He was hooked. Yeller Feller hung out at the barn and stayed under foot. He also decided he wanted to have a kitty friend in our best pal Nightmare, a.k.a Mare (Yes, I know. He’s neither a horse or a female, but Mare it is.). Anyway, Mare was having none of it. But this neurotic farm mamma tried to help them work it out, giving love and attention to both, but it was just not working. Mare, who is the barn-cat-in-chief, was changing rapidly. He wouldn’t come when called. (Yes, he is part dog and does come when called.) He wouldn’t let us pet him. He wouldn’t come in at night, which is our routine that lets this farm mama sleep peacefully. Mare started hiding in the barn attic, where the Texas heat was rising, and so we had to figure out a plan B. Now, if you know me at all, you know parting with a critter is something that is nearly impossible for me to do, but as I grow in this farmtastic journey, I’ve also learned that I owe it to the ones we have, all sixteen of them, to keep them safe, sound, and happy. 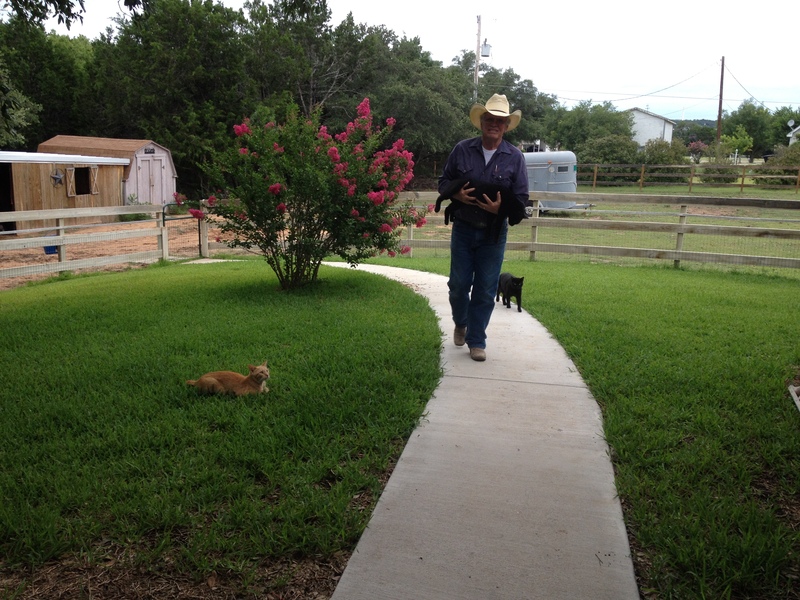 Dad and his three kitties. Just call him Dr. Dad-little. He loves them and they love him. Anyway, Dad came and packed up Mr. Feller and carted him home. They spent a couple of days working through howdy-dos with all the proper stares and inspections. Mom and Dad spent loads of porch time with Yeller giving him attention to teach him where his new home was. Gram even fell in love with the little guy, and cats are not her thing. Well wouldn’t you know it, Yeller Feller caught on like a champ. Ate up every pet and ear scratch, and even discovered tree climbing. Although, Mom says he’s not too good at it yet. He’s having one big dandy time. 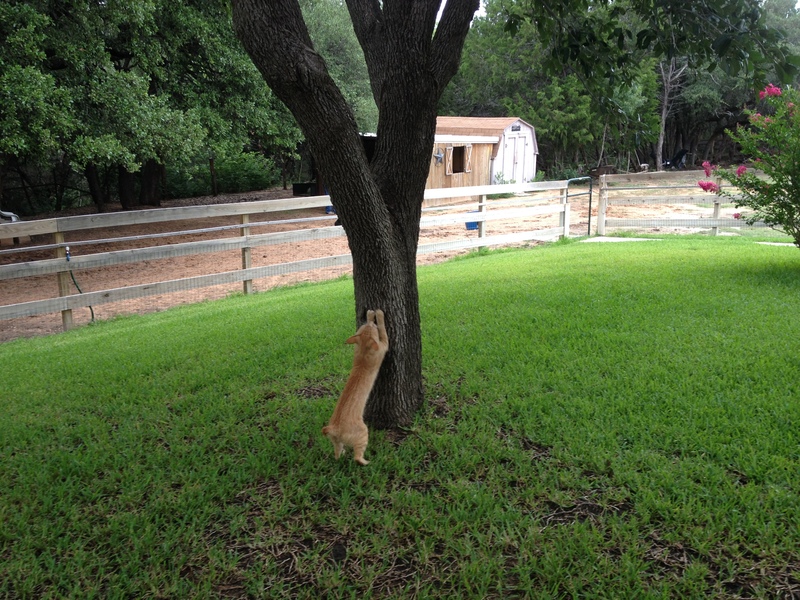 Yeller Feller tries to climb a tree. Let’s hope he gets the hang of it. So my heart rests easy knowing that Yeller came by his fur-ever family via the farm. So on our Meet the Farm page, Yeller has moved form a fur-kid to a farm friend. I guess technically he’s now my brother, since we share parents. Nothing new for me, the best siblings have four legs. Yes, let’s hope he catches on. From what I hear he’s good on the way up, and then panics a bit on the way down. Thanks for dropping by and reading my blog. Have a blessed day!